All MoneyWorks products share the same user interface and use the same database file format. You can easily upgrade at any time. You can create as many company data files as you want—there are no additional fees or activations for creating new data files. Have payments, receipts, invoices and journals automatically re-generate. Flexible recurring patterns allows recurrences every so many days, weeks, months etc. Great for repeating transactions such as rent and insurances. Transactions can recur a designated number of times, to a designated date, or forever. Automatically update item prices and descriptions on recurring invoices. Customise your data entry screens for faster, more accurate data entry. Optionally display additional fields for data-entry. Omit fields from tabbing order to speed data-entry. Have fields default to previous value. Use drop downs to speed data-entry. Add validation rules for greater accuracy. Customise your lists to see just the information you need. Re-arrange the list columns to be in your preferred order. Remove or add columns to see just the information you need. Add calculated columns to see derived data [not Cashbook]. Sort lists and print with subtotals. Create filters to see subsets of information. Auto-fill list, configurable pick-lists and custom validations speed up data entry and reduce errors. Auto-fill lists show possible matches in real time as you type. If you don't know the code, start typing any word from the description and still get a match. If you often type similar transaction descriptions, you'll find the autofill-from-history a big time saver. Assign a pick-list to most data entry fields to restrict data entry to specific values. Pick lists will appear as dropdowns as data is being entered, or as a choices list if invalid data is entered. Match an entry against a formula to enhance accuracy (e.g. telephone numbers must be 7 digits). Match an entry against other data in your file (e.g. must be an existing customer resident in Florida). Ensure data is entered into mandatory fields by using a validation. MoneyWorks presents all your valuable data in easily accessible lists, allowing you to quickly find and present the information you need. Access your data (transactions, customers, products, jobs etc) with a single keystroke. Quickly find just the data you need with fast "google-like" text searching (great for finding serial numbers or other text recorded in transactions). Use powerful search expressions for more complex searching (e.g. all unpaid sales invoices with a value over $10,000 that are more than 60 days old). Configure your lists to display just the information you need (add and remove columns, move them around). Sort your data at the click of a button and prepare instant reports with subtotals. Quickly email important documents such as invoices, orders or reports. 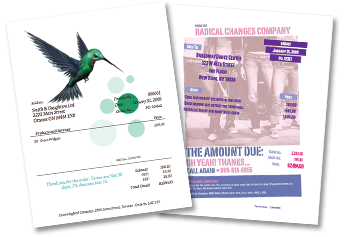 Email any MoneyWorks form (invoice, receipt, statement1 etc) or report as a pdf. Invoices and statements1 can be emailed in bulk to their respective recipients. Email selected reports or invoices to nominated recipient(s), such as your accountant or bank manager. Email through your computer's email client (Outlook, Mail etc) or directly using your smtp server. Use the MoneyWorks Forms Designer [not available in Cashbook] to prepare personalised letters or newsletters for emailing as pdfs. Send reports direct to MS Office, iWork or output to pdf. Save/email any report or form (invoice, statement etc) as a pdf. Reports can also be sent direct to Excel or Numbers, for further manipulation. Copy and paste records (transactions, customers etc) from any MoneyWorks list and paste into Excel/Word/Numbers. Set up Excel macros to directly interrogate MoneyWorks (e.g. get live cost prices for spreadsheet analysis). Download and import your bank statement from your bank's website. Let your bank do the data entry! 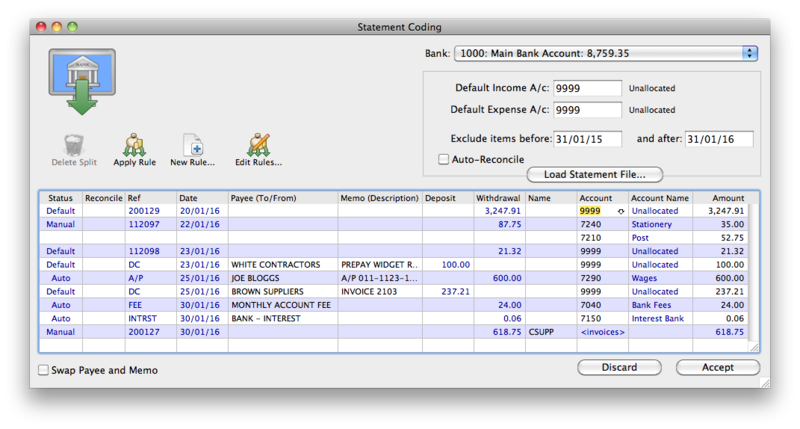 Easily import your bank statement for designated bank and date range. Supports qif, ofx, qfx, qbo formats. Save time by having your payments and receipts automatically encoded, based on text on statement and rules you set up. Allocate invoice payments to the respective originating invoices. Point and click bank reconciliation for fast, accurate reconciliations. 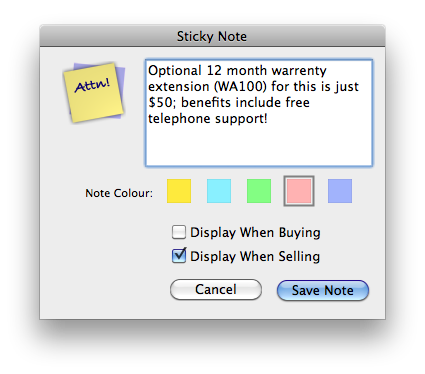 Single click to mark a transaction as reconciled (or unreconciled). Import bank statements and automatically reconcile. Create missing transactions within reconciliation window. Modify incorrect transactions within the reconciliation. Reconcile any account (not just bank accounts). Bank Reconciliation Status report gives at a glance summary of all reconciliations. The immutable audit trails that are built-in to MoneyWorks give you and your accountant peace of mind by allowing you to see who changed what (and when). Because the accounting substance of a posted transaction cannot be altered, you can determine exactly how account balances have been changed, something your accountant will appreciate. 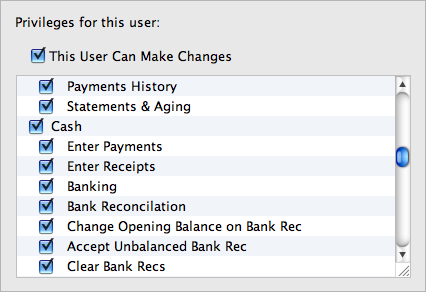 Transactions are tagged with user details when entered/posted, allowing you to see who made changes when. Structural changes to the chart of accounts are logged, as are other significant accounting events (bank reconciliations, ageing etc). Complete audit trails maintained of all tax transactions. Inventory movements in MoneyWorks Gold/Datacentre will leave a complete audit trail. MoneyWorks provides unparalleled support for your accountant, ensuring that you and your accountant can interchange data easily. As a registered MoneyWorks user, your accountant may be eligible for a special (free) support copy of MoneyWorks, so you will be 100% compatible. MoneyWorks data files are cross-platform, so it doesn't matter if your accountant uses a PC and you use a Mac (or vice versa). The built-in Accountants Export feature allows you to easily create (and email) a backup copy of your MoneyWorks file. The Accountants Export also supports data formats suitable to a number of popular accountants packages, if your accountant prefers these. 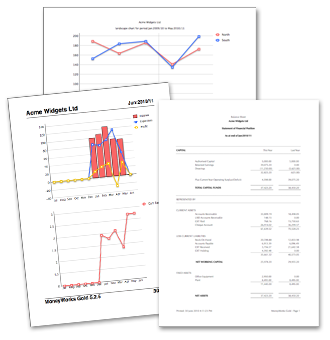 Additional accounting export formats can be easily added as a MoneyWorks report plug-in. MoneyWorks even supports a parallel chart of accounts, allowing you to use your preferred codes and your accountant to report in theirs. Accountants (and other remote users) can access suitably configured MoneyWorks Datacentre files over the internet, allowing real-time access. Your accountant will love the audit trails, enquiries, drill-down and reconciliation features of MoneyWorks, not to mention the powerful general ledger and reporting capabilities. 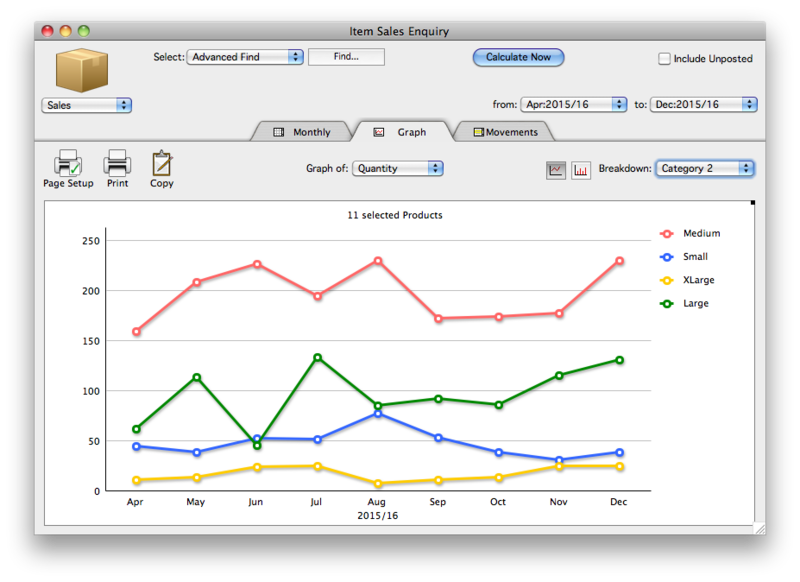 See at a glance how the business is operating with the MoneyWorks Dashboards. As well as providing enhanced financial control, these provide better insights and tighten control. 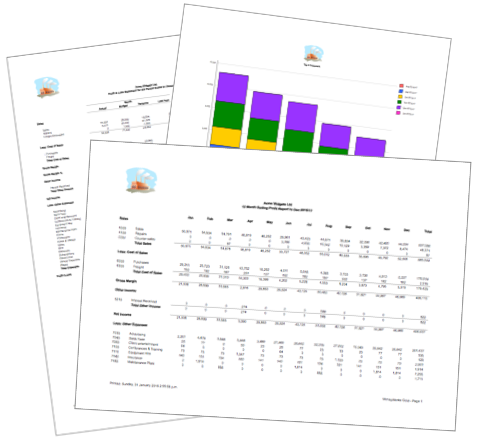 Dashboards provide at a glance overview of key financial data and trends. Drill down to see underlying data. See income trends over last five years. Dashboard information is protected by user privileges for security. 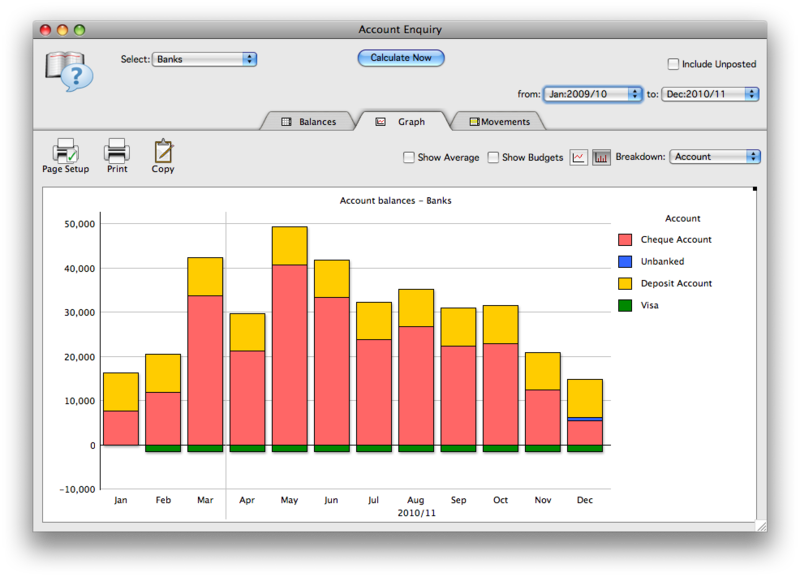 Customise your dashboard or create new ones in MoneyWorks Gold/Datacentre. Store your original source documents (orders, invoices, contracts etc) in MoneyWorks for easy retrieval and reduce expensive paper storage. Easily attach a scanned document or pdf to a transaction. Retrieve attached documents at the click of a button. Place product images into the Items file and use in catalogs, invoices and orders. For MoneyWorks Datacenter, scanned documents are automatically uploaded to the server and retrieved only when requested. Scanned documents and images are stored outside the core database, so have no impact on speed or file size. Track serial and batch (lot) numbers. 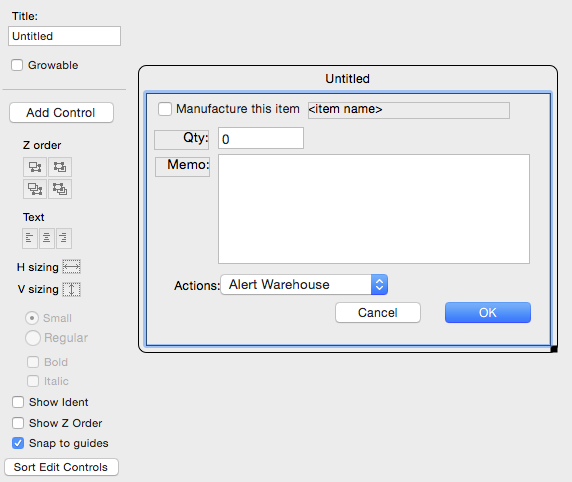 Set selected inventoried items to require serial or batch numbers. Record serial/batch numbers on newly purchased stock. Batches can have an optional expiry date. Scan or enter serial/batch numbers, or select from choices window, during sales. Serial and batch numbers can be up to 31 characters. Use and track serial and batch numbers in jobs. Track stock over multiple locations/warehouses. Define as many locations as you need. Location codes are up to 15 characters. Buy/sell stock from designated locations. Manage serial and batch numbers across locations. Complete audit trail of all stock movements by location. MoneyWorks allows the storage of "off-ledger" values— non-financial monthly time series data (both actual and budget) that allow you to specify and monitor your own key performance indicators (KPIs). Keep actual values for over seven years. Store forward budgets for next 15 months. Access off-ledger values in reports, scripts and forms. Calculate KPIs based on stored and budgeted values. 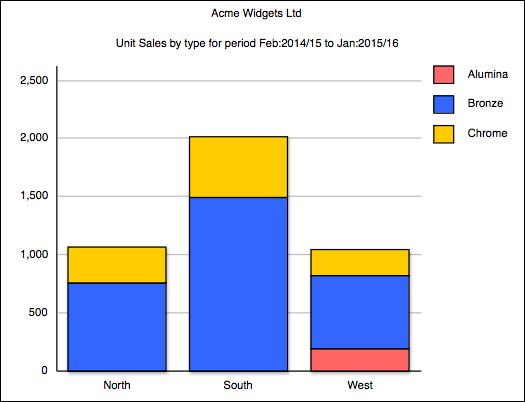 Display KPIs in custom dashboards. The MoneyWorks window and user interface builder allows you to create new list views, entry windows and alerts, and even add new fields to some existing entry window. Add fields and controls (check-box, radio buttons etc). MoneyWorks Datacentre supports multiple, concurrent users, allowing authorised users to perform tasks simultaneously. For example, several users can be entering sales orders at the same time. Concurrent licencing enables you to install the MoneyWorks Gold client on as many workstations as you like - only active connections are counted. Datacentre comes standard with three concurrent client licenses, add more as required (supports over 50 concurrent users). Single company or multiple company options are available. Serves multiple accounting files: any (authorised) user can access any file on demand. Server is always available, making remote access possible over the internet. Datacentre has highly optimised networking and server-side operations, making for extremely fast remote connections without the need for expensive thin client solutions. 1MoneyWorks Datacentre and Gold run on Windows 7 and later, and Mac OS X 10.7.5 (Lion) or later. MoneyWorks Now is a full cloud based solution, hosted on a central server and accessible through the public cloud. Unlike traditional cloud services, MoneyWorks Now provides full access to desktop services, and, because it is not browser based, is fast and efficient to use. With MoneyWorks Datacentre you can operate your own private cloud, using your own server and infrastructure, providing you with greater control of your sensitive accounting information. Access your MoneyWorks accounts from any PC or Mac*. Live access to your MoneyWorks accounts from tablet and smartphone apps. Update MoneyWorks from other web-enabled systems (e.g. ecommerce) using the REST APIs.